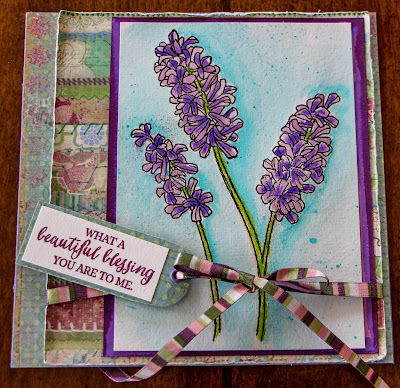 With spring somewhere around the corner, this gorgeous hyacinth image was a cheery choice for my watercolor experiments. 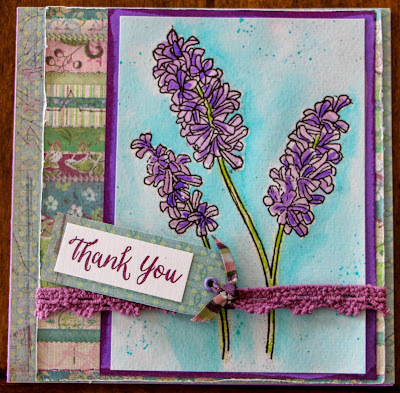 The hyacinth image is from Stampin' Up! 's Helping Me Grow set. 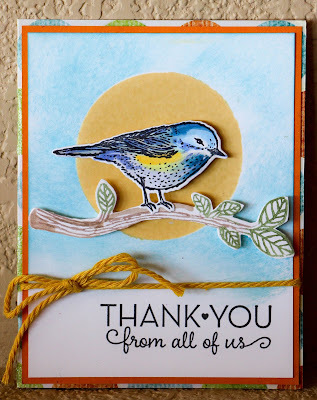 I used a clear VersaMark ink pad to stamp the image, and then sprinkled it with a fine black embossing powder and used a heat gun to emboss the image. As mentioned in the previous post, the embossed lines trap the Distress Stains as you color the image. When using Tim Holtz Distress Stains for watercoloring, you want to start with your lighter colors first. You can even water down these light subtle shades before painting. The water will open up the fibers in the watercolor paper, allowing subsequent layers of color to move and grab the paper. Move on to medium and darker shades next, mixing the stains with water or using them full strength. 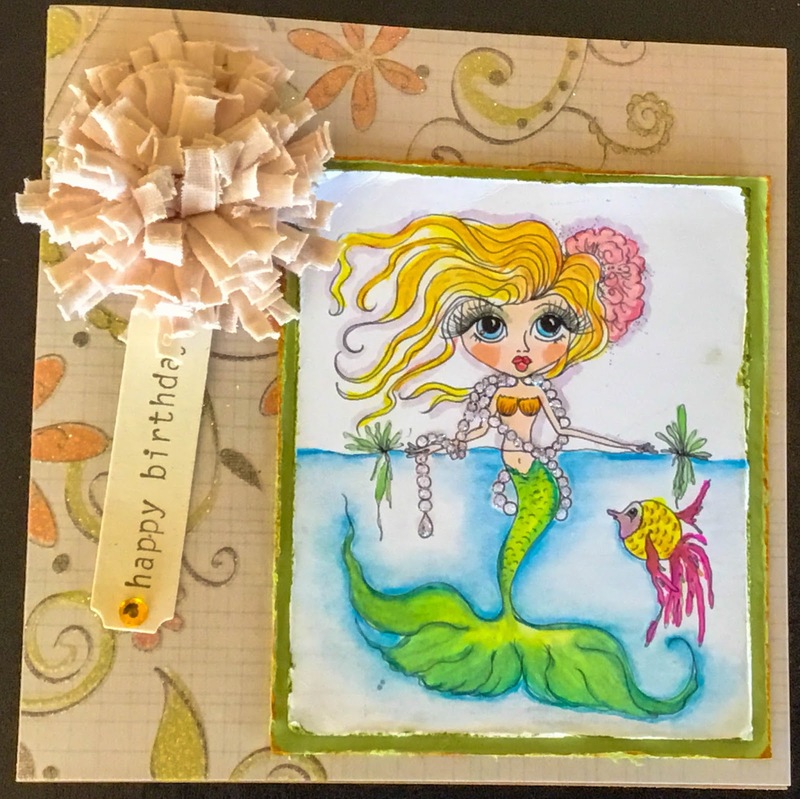 Water can be used to help blend colors on the paper. 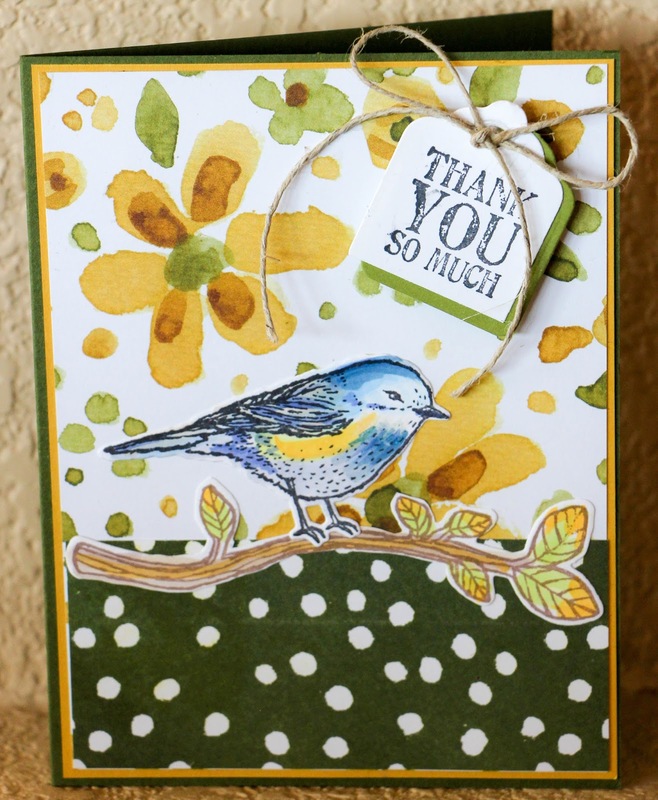 Finish off your card with ribbons, eyelets and sentiments. 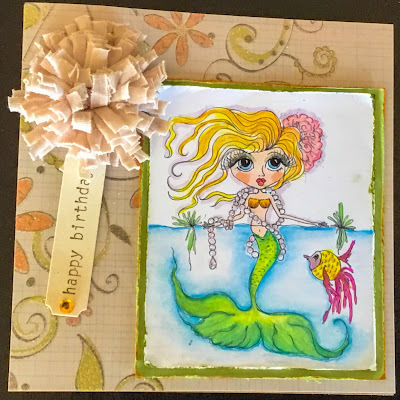 I've used lots of different products over the years to watercolor images, but this was my first time to paint with Tim Holtz Distress Stains. I have to say that these stains are incredibly easy to use. 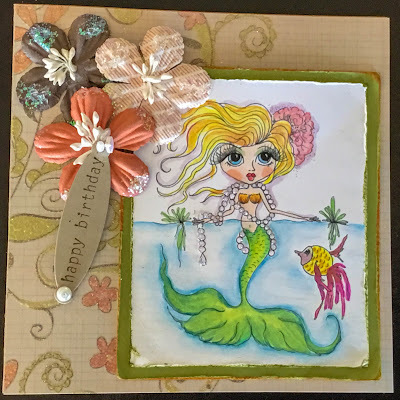 Inspired by other stampers, I embossed the SU Helping Me Grow image onto watercolor paper first, using white ink and embossing powder. 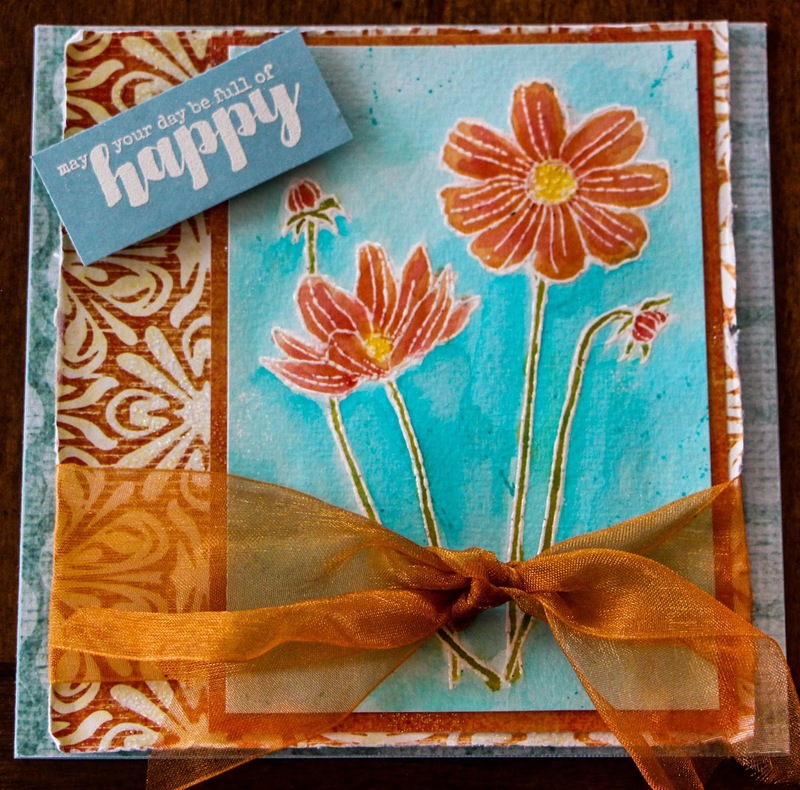 The difference between these two cards is the thickness of the embossing powder. 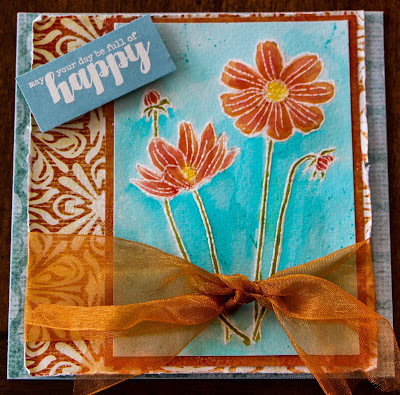 The card on top used a fine white embossing powder that created thinner lines; the bottom card has Melt Art Ultra Thick Embossing Enamel. They create two different looks, and I would suggest sticking with a finer embossing powder so that the stains don't seep out of the embossed area. When I lived in Asia many moons ago, I occasionally played with batik paint on fabric. This technique reminded me of batik, as the Distress Stains spread out and are captured within the embossed lines. 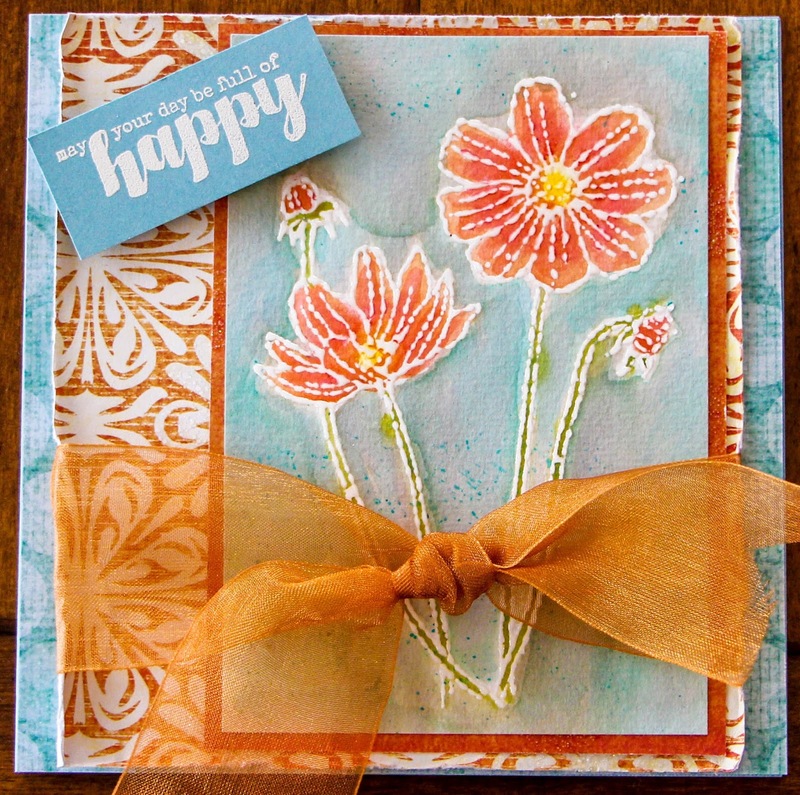 I used a newly acquired Unity Stamp Company sentiment (May Your Day Be Full of Happy), which also was embossed with white ink and powder. This technique would be especially easy to teach to novice stampers because it is so forgiving, yet so enjoyable. I have lots of friends who adore their tea, and I often send birthday cards to my tea-obsessed friends. 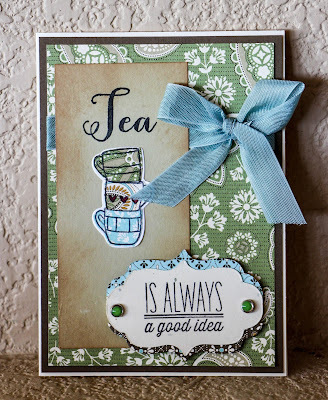 While I can make a traditional birthday card, I often like to send tea-themed cards, so I am always on the search for new tea-related stamps. 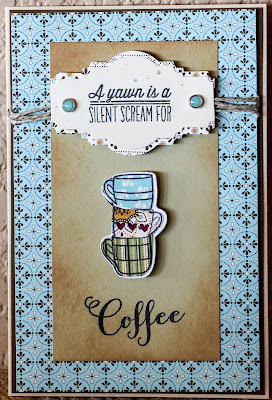 When Verve Stamps came out with both tea and coffee-inspired sets, One Cup and Coffee, I was quick to order them, along with the coordinating dies. I am hesitant to confess this to tea friends, but I also like my coffee! The Verve website has a handful of card samples to provide inspiration, such as the cards I made here. These cards are very easy to make and straightforward. The only quasi "technical" thing I did was cutting apart the stacked cups to mix different patterns. You can see below that I used black ink (Memento Tuxedo Black) to stamp the image onto some patterned designer papers. 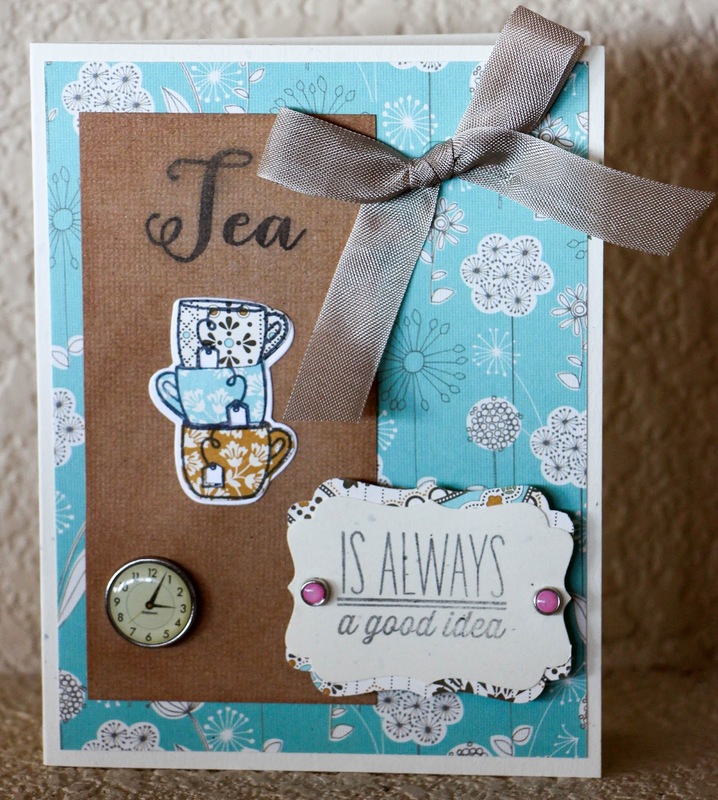 I used the coordinating Verve die to cut out the patterned stacked cups and also some white card stock cups to use as a base. Then I trimmed out individual cups and glued those pieces onto the white die cutout base. Not only is the Stampin' Up "Best Birds" stamp set adorable, but it has a matching Thinlits Die Set. 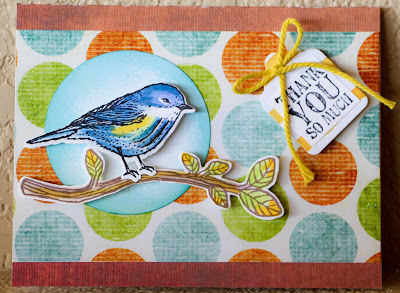 Let's face it: who really enjoys cutting out stamped images? 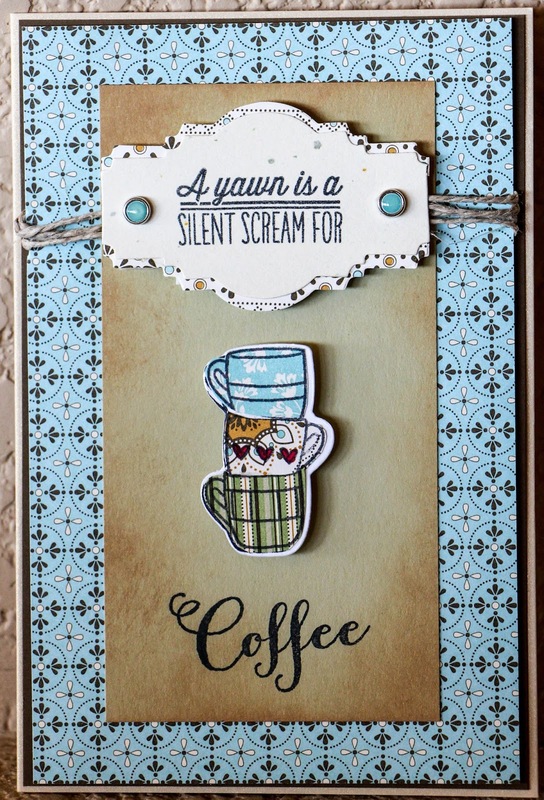 I'd much rather use my Sizzix Big Shot and knock out some dies on the fly. 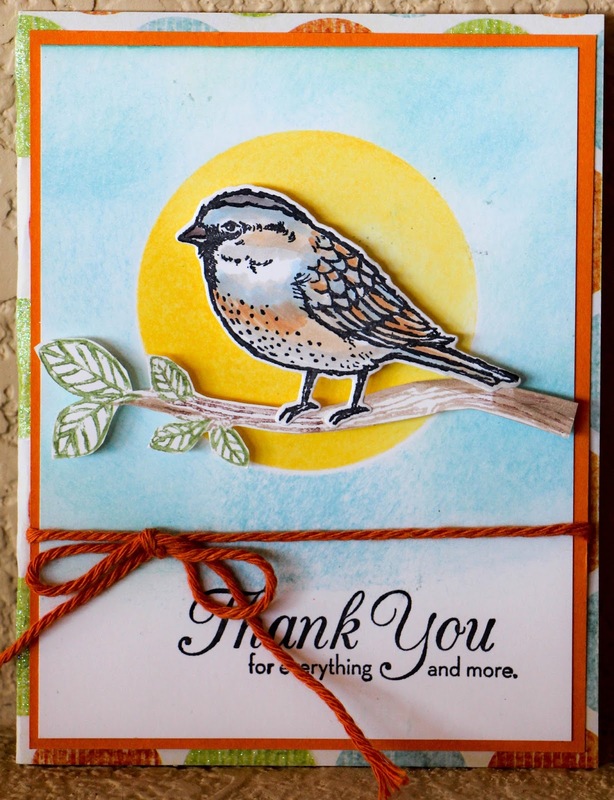 The Copic Markers were called into action for coloring the birds and branches in these cards. 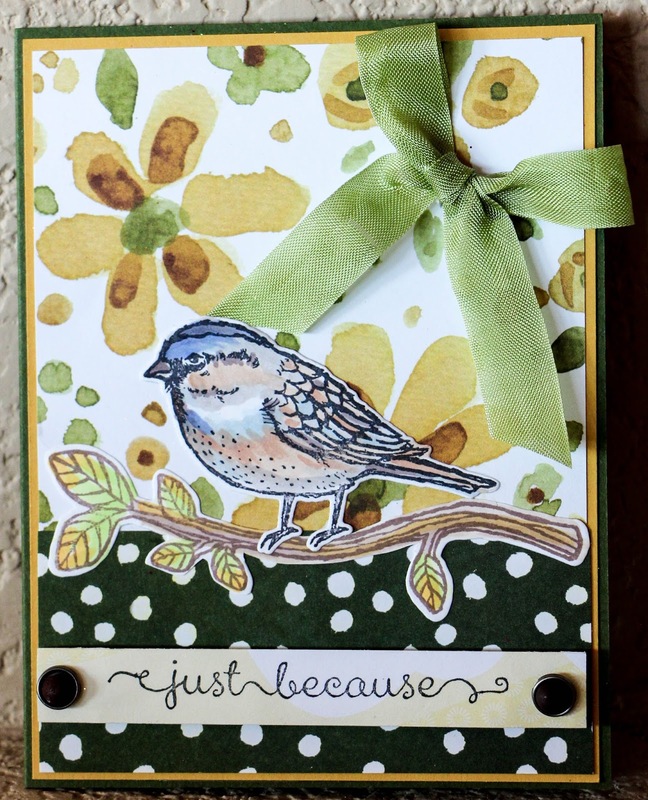 In addition to the SU Best Birds stamp set, all the cards (except the one below) include sentiment stamps from Stampin' Up. 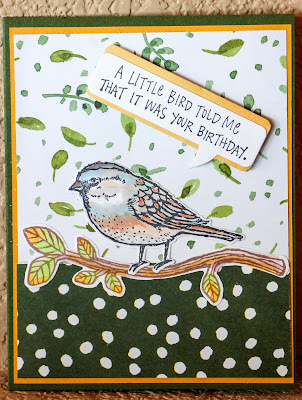 I absolutely love the "little bird told me" birthday sentiment stamp that I used on the card above. It's an Inkadinkado stamp that I've owned for about 10 years. The card above includes a moon made from the Stampin' Up 2 1/2-inch punch. A sponge with SU Marina Mist ink gave the moon its illumination. The card above and below uses a bit of masking and ink sponging to create the sun silhouette. I used the SU 2 1/2-inch punch to create the masks. All these techniques are incredibly easy, so give them a try! 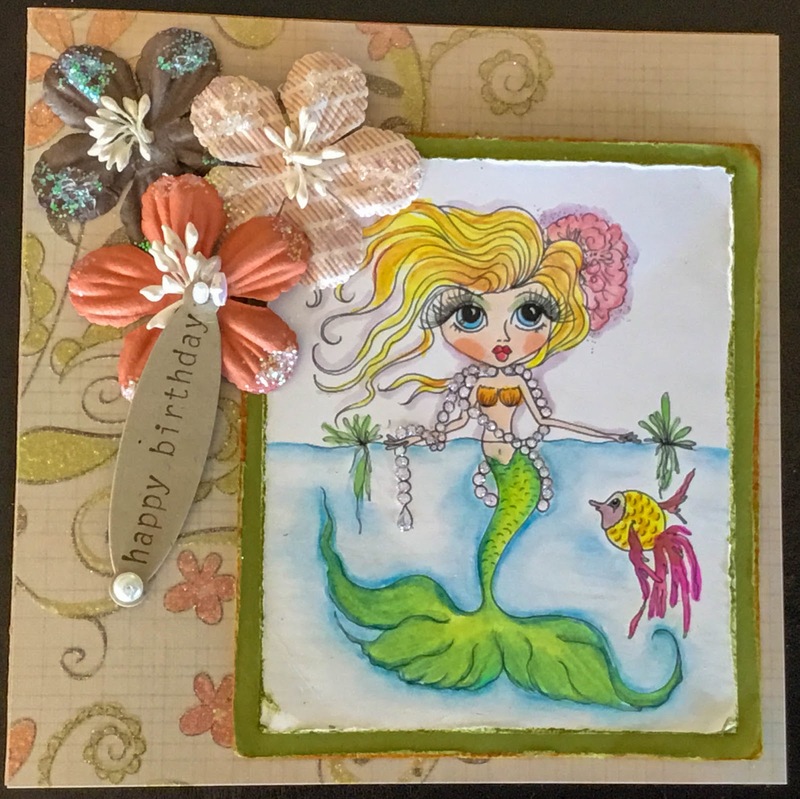 One of my dearest friends, Diane, had a January birthday, and I wanted to create a mermaid card for her as she loves mermaids. 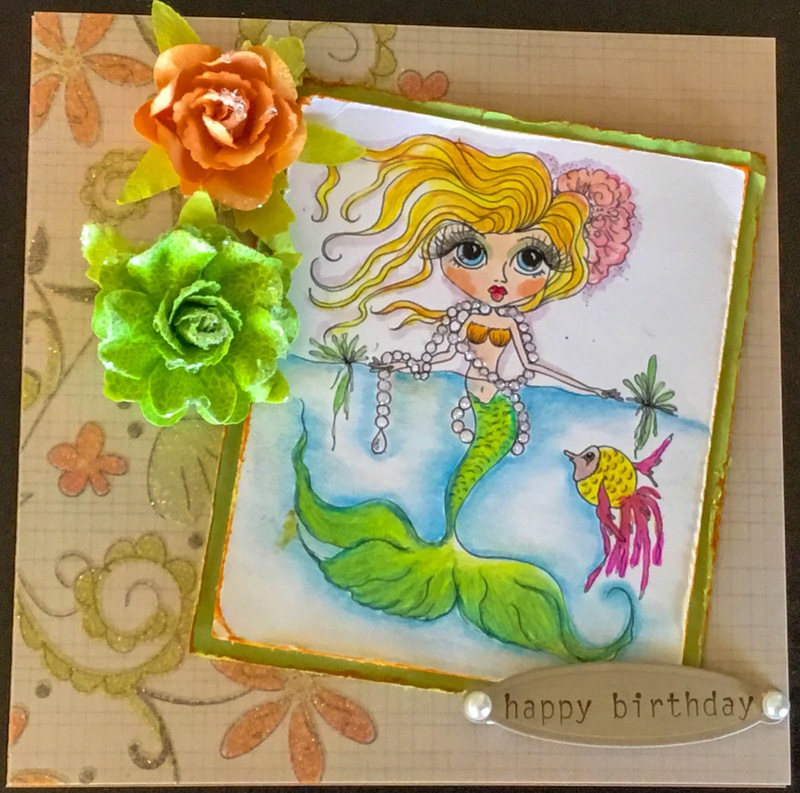 It's hard finding just the right mermaid image that isn't too over the top (or without a top) or too cutsy!! 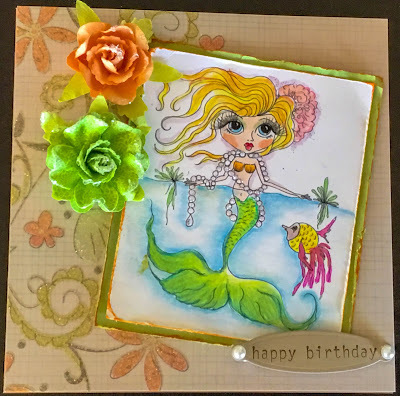 I stumbled across Sherri Baldy's illustrations, and this gorgeous mermaid spoke to me. I colored the mermaid image with Prismacolor pencils and Copic markers. Different background papers and embellishments were used, too. I sure hope Diane liked it, too!